Late drama at the Sainsbury’s Glasgow International Match saw the German team clinch victory ahead of Great Britain and France at the Emirates Arena. Top of the team table with the two 4x400m relay events to go, it seemed that France had done enough to claim the title for the first time with a runner-up spot in the men’s race. However, after starting their celebrations it was announced that France had been disqualified from the men’s 4x400m, leaving Germany to claim the match title with 50 points and France level on 49 points with Great Britain. Scotland finished fourth with 35 points. With each team including one male and one female ‘ace’ athlete who claimed double points, Great Britain lost out on valuable points when the team’s male ace, world indoor 60m champion Richard Kilty, was disqualified for a false start. Having been asked to stand up once after being held in the blocks, Kilty twitched before the gun and later tweeted: “Sorry to everyone who I let down there. Starter held us very long, still no excuse for the twitch. Bad mistake with my experience.” Emmanuel Biron went on to win, with Scotland’s 16-year-old Cameron Tindle running a 6.92 PB in third. Former European 100m champion Verena Sailer was one of Germany’s aces and she claimed the maximum eight points in the women’s event, clocking 7.27 ahead of GB’s Rachel Johncock who ran 7.34 for the runner-up spot to equal the Welsh record. Germany had also earlier made the most of double points available for their male ace, Florian Orth winning the 1500m in 3:40.20 for another eight points. Julian Howard won the long jump with 7.81m as GB’s Chris Tomlinson finished second from just one jump as he leapt 7.61m before withdrawing with a hamstring problem. The German team had not looked the strongest on paper but still arrived in Glasgow as the team to beat. 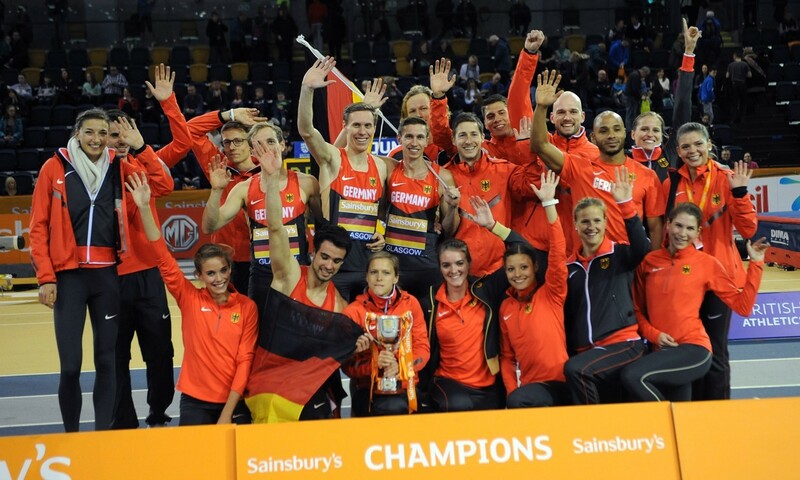 A German team also won the European Team Championships on home soil last June when France finished third and Great Britain fifth. This time France and Great Britain shared the runner-up spot, though, with GB closing the gap behind leaders France and Germany in the final two events, the 4x400m relays. Dominant performances by both GB teams gained a full eight points and women’s team anchor Kelly Massey was awarded the Sainsbury’s performance of the day after also winning the individual event in a 52.95 indoor PB. Other winners on the GB team included Jess Judd, making her indoor 1500m debut, and high jumper Chris Kandu, who equalled his indoor PB of 2.23m set two weeks ago and was just one centimetre off his overall PB. 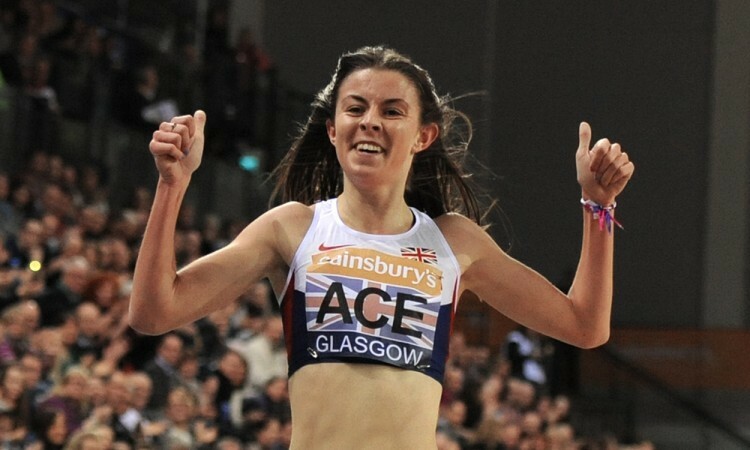 Judd enjoyed almost a two-second victory as she clocked 4:14.53 for eight points as GB’s female ace athlete ahead of France’s Claire Perraux who had won the battle for second with Scotland’s Josephine Moultrie. “I really enjoyed it and just raced it how George (Gandy, her coach) told me,” said Judd. “I messed up the first couple of laps mainly because I haven’t done it for so long – I thought I was miles off the back. Serita Solomon was another to claim full points for GB as she ran an 8.13 60m hurdles PB. European 100m hurdles silver medallist Cindy Billaud pulled up as she approached the line and clocked 8.59 for third. Pascal Martinot-Lagarde and Éloyse Lesueur were among the favourites on the French team and both lived up to their billings – Martinot-Lagarde winning the 60m hurdles in 7.63 ahead of Germany’s Erik Balnuweit as GB teenager David Omoregie clocked 7.82 for third and Lesueur leaping 6.59m to win a long jump competition which saw Commonwealth silver medallist Jazmin Sawyers set a indoor PB of 6.45m for third. Renelle Lamote ran an 800m world lead and PB of 2:01.97. Jamie Bowie got the crowds cheering as the Scottish sprinter won the 400m, beating GB’s team captain Conrad Williams 47.38 to 47.52. There was also big support for Scotland ace athlete Guy Learmonth but he had to settle for the runner-up spot in the 800m as Germany’s Robin Schembera held on to take the win in 1:48.41 as Learmonth clocked 1:48.59. As well as international match action, the meeting also included Club:Connect relays which incorporated the Scottish Junior Championships. The Club:Connect campaign was launched last year and gives young athletes the chance to compete on the same stage as international elites. The determination of the rising stars to perform on such a stage was demonstrated particularly in the closest race of the day, the under-17 women’s 4x200m relay, as the Edinburgh AC anchor dived over the line to secure victory as well as a cheque for her club.